Do you think that I can be an advocate? Oh yes! Personal stories carry so much weight and each one of us has a story to tell. The challenge is to learn how to deliver your message in a concise way. 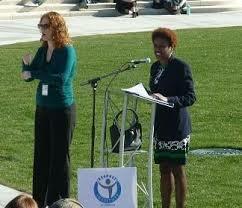 NAMI Smarts gives you the tools to be a successful advocate. While you may not be ready to speak in front of the Georgia dome during Mental Health day at the Capitol, you will be able to better tell your story after taking NAMI Smarts. NAMI Smarts for Advocacy is a popular hands-on advocacy training program that helps people living with mental illness, friends and family transform their passion and lived experience into skillful grassroots advocacy. Yes, you can be an effective advocate. Module 1: Telling a compelling story that is inspiring and makes an “ask” in 90 seconds. Module 2: Writing an effective email, making an elevator speech and making an impactful phone call. Module 3: Orchestrating a successful meeting with an elected official. Module 4: Medication: Protecting Choice is a standalone module where the participant learns to advocate on medication issues. Module 5: Parity: Fairness in Health Coverage is a standalone module where the participant learns about insurance parity. 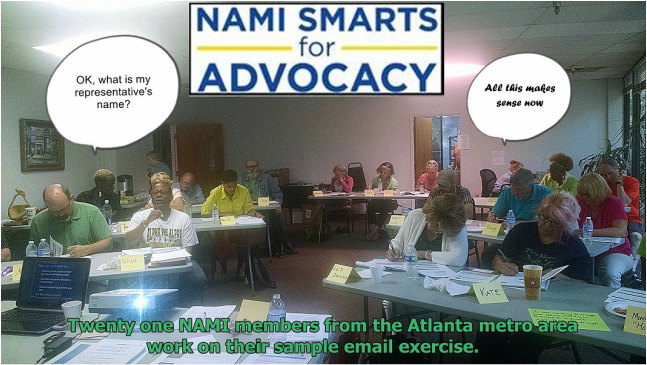 The unique step-by-step, skill-building design of NAMI Smarts is effective with a wide range of participants—from those who are new to advocacy to individuals with more experience. Participants routinely share that they’ve never been able to condense their story or made a clear “ask” and, with NAMI Smarts, they were able to. Lobbyists who represent NAMI State Organizations or mental health coalitions love this program—they see participants come out confident and able to share their story in a way that moves policymakers.